Three thunderstorm events brought torrential downpours in excess of 50 mm in an hour in Winnipeg in 2018. These events occurred on May 30, July 19 and September 12. On May 30, a slow-moving thunderstorm (radar loop) moved through western and central parts of Winnipeg in the mid afternoon hours. It dumped 30 to over 50 mm of rain in an hour. The maximum recorded rainfall amount in an hour was 53 mm between 3:49 pm and 4:49 pm in Tuxedo. The heavy downpours resulted in flooded roadways (including Route 90), flooded underpasses, flooded basements and overflowing manholes. The Jubilee Underpass closed for at least an hour due to flooding. Flooding inside the Fairmont Hotel was also reported. According to Weatherlogics, the maximum recorded rainfall amount with the storm was 74.2 mm in River Heights. Their map, posted here, shows the tight gradient in rainfall amounts through the city. Generally, 30 to 70 mm of rain fell from Tuxedo to Downtown, with a secondary maximum in amounts of 30 to 50 mm along the West Perimeter from Wilkes to Centreport Canada Way. Amounts dropped dramatically eastward with only 5 to 10 mm in south St Vital and eastern Transcona. 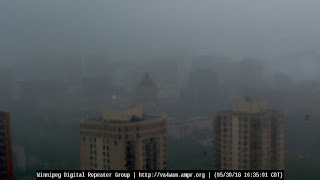 Slow-moving pop-up thunderstorms once again drenched parts of the city on July 19 (radar loop). Waverley West, the Kildonans and Riverbend all received 40 to 60 mm of rain within an hour. The maximum 1-hour rainfall amount recorded was 61.5 mm in Riverbend. In total, the event dropped 60 to 85 mm of rain from North Kildonan to East St Paul. The City of Winnipeg's rainfall map shows well the isolated nature of these heavy downpours. Yet another severe rain event occurred on September 12. This one once again affected the Riverview and East St Paul area with 50 to 60 mm in an hour. The same occurred further west around Red River College and Amber Trails. More details on this event will be provided in another story below. 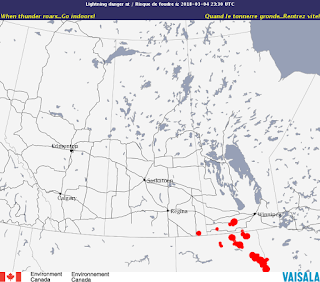 Strong thunderstorms developed in southwestern Manitoba and southeastern Saskatchewan in the afternoon of June 14, then pushed eastward through the late afternoon and evening hours into the Red River Valley (radar loop). The storms were most intense in southwestern Manitoba, producing two main swaths of large hail and damaging winds; the first, from Estevan, SK to south of Melita and Killarney, MB, and the second from Minto and Ninette southeastward to Morden-Winkler. Weatherlogics produced a map of severe reports that illustrated these swaths very well. It was one of the biggest thunderstorm events of the year throughout southern Manitoba, dumping hail up to baseball sized and producing wind gusts over 100 km/h. The maximum recorded wind gust of 140 km/h occurred in Minto at the Manitoba Agriculture station. Baseball sized hail and wind gusts up to 128 km/h occurred in Ninette, causing significant property damage. A tornado also briefly touched down near Waskada, but with no reported damage. 18,000 Manitoba Hydro customers were without power as a result of the storms. Damages were significant, with insurance claims to MPI totalling close to 20 million dollars with total insured damages across southeastern SK and southwestern MB over 90 million dollars. In Winnipeg, strong wind gusts in excess of 75 km/h occurred both ahead and behind the storms. The strongest wind gust of 87 km/h was recorded at the International Airport (YWG) ahead of the storms around 8:45 pm CDT. Long-lasting heavy rain also occurred with a wide swath of 20 to 40 mm throughout the city. The longevity of the event resulted in substantial delays at Investors Group Field. The Edmonton Eskimos were playing against the Winnipeg Blue Bombers. Lightning in the area resulted in a delay in play lasting 2 hours and 55 minutes, beating the previous CFL record for weather-related delays. The game, lasting over 5 hours, was the second longest in CFL history. The day was, in fact, primed for severe weather. The SPC south of the border had issued a rare moderate risk along the US border, bordering southeastern SK and southwestern MB. The strongest low pressure system of the year, a Colorado Low, moved into southern Manitoba on March 4 and 5. It brought the worst snowstorm of the year with a wide swath of 15 to 30 cm throughout southern Manitoba. Winnipeg received 18 to 23 cm of snow based on reports from CoCoRaHS and Twitter. Brandon received 26 to 28 cm. It was a heavy wet snow, bringing much needed moisture not only to southern Manitoba, but also throughout the Northern Plains of the US and the Canadian Prairies. In fact, ECCC coined it ''The Million Dollar Blizzard'', for its beneficial moisture after an exceptionally dry winter across the Prairies. According to CBC, the system also caused power outages to some 10,000 customers across southern Manitoba and the closure of some highways, including highway 75 and the Trans Canada. School buses were also cancelled in all Winnipeg school divisions. What was most unusual about the system was the extensiveness of thunderstorms and thundersnow associated with it. Thunder in the first week of March, though not unheard of, is unusual in southern Manitoba. The system produced widespread thundersnow along, south and north of the US border, enough for several communities to experience it. Manitoba Storm Chasers has stunning video of the storms here. Another video from Saskatchewan can be seen here. South of the border, Grand Forks Airport recorded thunderstorm activity lasting two hours, along with heavy downpours of rain and small hail. Although no thundersnow was reported at Winnipeg International Airport, lightning was visible from the south side of the city as thundersnow occurred just southwest of the city just after midnight. The visible satellite loop below shows the beginnings of the system as it moved into southern Manitoba. Building towering cumulus (TCU) can be seen in northern North Dakota and moving into southern Manitoba. These produced the thunderstorms and thundersnow that were observed. Frigid weather conditions gripped the Northern US Plains and Canadian Prairies in the last few days of March and first half of April. These temperatures helped delay the snow melt and produce a later than normal start to spring. Temperatures remained below freezing for several days in early April. In fact, 8 consecutive days never reached freezing from April 1 to 8 at Winnipeg International Airport, tied with April 1-8, 1874 for longest such streak in April since 1872. The daytime high of -10.6°C on April 2 was the first minus double digit high in April since 1997. The low of -20.5°C on April 3 was also the coldest in April since 1997. Averaged out, the first half of April was the second coldest on record in Winnipeg since 1872, with a mean temperature of -6.8°C according to Weatherlogics. It was even colder out west, where the first half of April was the coldest on record in Brandon (mean -8.9°C). In fact, tempeartures dipped to the -20s on several occasions in Alberta and Saskatchewan. 5 days dipped below -20°C in Saskatoon. At coldest, Edmonton dipped to -25.0°C (6th), Saskatoon -24.6°C (7th) and Regina -23.9°C (7th). These were all the latest dates to reach temperatures as cold as they were. In the end, April ''only'' tied for 19th coldest since 1872 in Winnipeg with a mean temperature of 0.3°C. However, it was even colder to the south and west where the core of the cold air mass was placed in early April. South of the border, Fargo had a 6th coldest April and Grand Forks an 8th coldest April according to Daryl Ritchison. To the west, it was the 8th coldest April in Brandon and 11th coldest April in Regina according to Weatherlogics. Grand Forks, ND also had its coldest first half of April on record. After exceptionally dry weather most of the year, the skies finally opened up in September in the Winnipeg area with frequent rain and thunderstorms. However, the timing of this rainfall could not have been worse for farmers who would have benefitted from more rain during growth in the summer instead of during the harvest season. Cool and muddy conditions made harvesting difficult and delayed. In total, 5 days saw thunderstorms in Winnipeg, tied with five other years for 2nd most thunderstorms days in September since 1953. In addition, 18 days saw measurable rainfall in September at Winnipeg International Airport, well above the normal of 10 days. This included a 9 consecutive day stretch of measurable rainfall from the 20th to 28th. The main event in September was a series of thunderstorms the night of September 12-13. 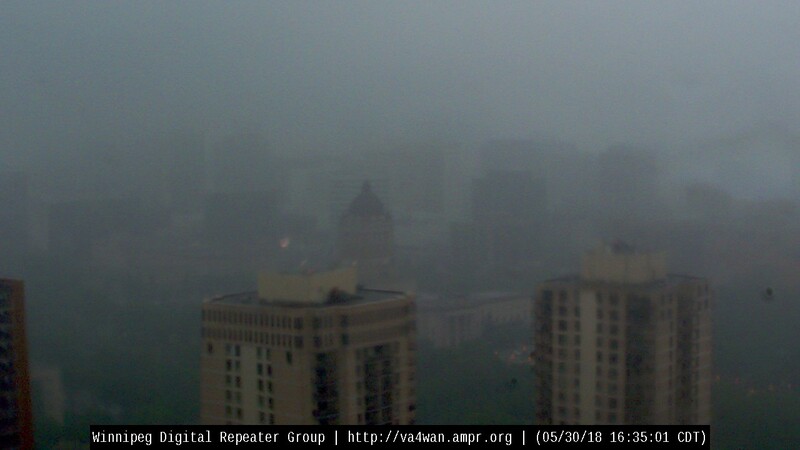 Two rounds of heavy thunderstorms pounded Winnipeg the evening of the 12th and during the overnight hours of the 13th. The first round moved through between 8:30 pm and 10:30 pm, producing torrential downpours and intense thunder and lightning (radar loop). 46.6 mm of rain fell at the Airport, making it the 6th rainiest September day since 1872. Locally, 50 to 60 mm fell in a hour from Red River College and Amber Trails to Riverbend and East St Paul. These amounts were equal to or higher than the normal amount of rain for the entire month of September! One lightning strike struck a home in West St Paul around 10 pm, causing a fire which burned it down. Yet another round of storms moved through between 2 and 4 am, dumping yet another 15 to 40 mm of rain through the city. Frequent and intense lightning occurred as well (radar loop). Hail as large as nickels also fell in some parts of the city. Generally, 25 to 70 mm of rain fell through the night throughout the city. Locally up to 90 mm was recorded in the East St Paul and Riverbend areas. With normal September rainfall only around 48 mm, this meant some parts of the city received more than a month's worth of rain in just one night. In the end, 114.9 mm of precipitation, 113.0 mm of which was rain, fell in September at Winnipeg International Airport. This made it the 9th rainiest and 9th wettest September on record since 1872. The 87.5 mm that fell in the first half of month made it the 5th wettest first half of September. It was also the wettest and rainiest September since 1977. A full summary of the event was posted here. Widespread and exceptional warmth occurred throughout the Prairies and US Plains in May and June. In Winnipeg, it was the 4th warmest May-June period since 1872. In Brandon, it was the 2nd warmest May-June period since 1890. In Winnipeg, May tied with 1978 for 9th warmest on record since 1872 with a mean temperature of 14.5°C. This was 3.1°C above the 1981-2010 normal of 11.4°C and the warmest since 1991. The month saw especially warm days with daytime highs averaging 22.8°C, tied with 1901 for 4th warmest on record since 1872, the warmest since 1980 and 4.4°C above normal. Six days reached or exceeded 30.0°C, tied with 1919 for second most 30°C days in May since 1872. The period of May 23 to 25 was nearly an official heat wave as temperatures reached or exceeded 31.5°C three days in a row. Humidity even came into the equation on some days with dewpoints reaching 20-21°C on May 24 in parts of the Red River Valley. In Winnipeg, the dewpoint reached 20.9°C on May 29, the second highest dewpoint reading on record in May since 1953 and the highest since 1969. 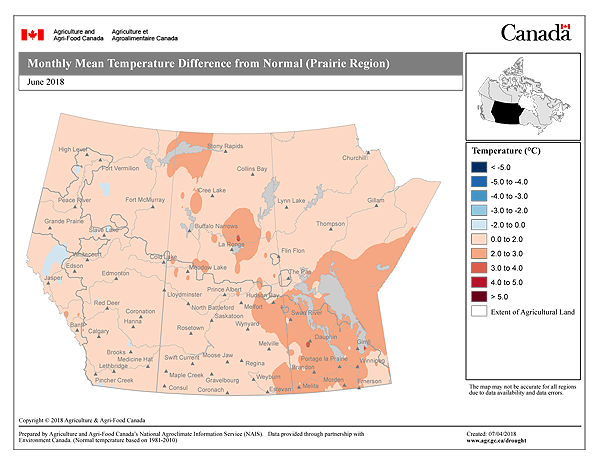 The warmth in May was not isolated to southern Manitoba. In fact, what made the event so unusual and extreme was how widespread the warmer than normal conditions were. Much of North America saw a warm May. In fact, eight US states (from Oklahoma to Virginia) had their warmest May on record since 1895. 33 US states had a top 5 warmest May and 41 states had a top 10 warmest May. Exceptional heat peaked in Minnesota, Iowa and South Dakota on May 27 and 28 with highs reaching 36 to 39°C. Minneapolis reached 100°F (38°C) on May 28, the earliest such occurrence on record and only the second occurrence of 100°F temperatures in May on record. The only other time was on May 31, 1934. Minneapolis also had the most consecutive days above 90°F (32°C) on record in May (5 days). In the Canadian Prairies, Regina had its warmest May on record since 1884. Saskatoon, Calgary and Edmonton all had a top 5 warmest May. The heat and humidity combined to create an active start to the thunderstorm season across southern Manitoba. Four severe thunderstorm days occurred in late May, with wind gusts of 90 km/h, hail up to golf ball sized and torrential downpours of 50 mm or more. June was also exceptionally warm, especially as compared to recent memory. It was in fact just as warm as a normal July, with a mean temperature of 19.6°C at Winnipeg International Airport. This tied for 11th warmest June since 1872. It was also the warmest June since 1995 (20.2°C). Daily highs averaged 25.7°C (tied 20th warmest and 2.6°C above normal) and daily lows averaged 13.4°C (tied 7th warmest and 2.8°C above normal). The main story was the consistency of the warmth as only four days reached 30°C. Throughout the May and June period, only one temperaure record was even broken. That record was a record high minimum temperature of 17.1°C on June 9. Further west, Brandon had an 8th warmest June and Edmonton a 7th warmest June. Other major cities had a top 20 warmest according to Weatherlogics. Exceptional cold and snowy weather occurred in the second half of September across southern Manitoba. This came as a surprise after such a long stretch of warm Septembers. In Winnipeg, 20 of the last 24 Septembers were warmer than normal and the city had just experienced five consecutive warmer than normal Septembers. It had been so long since it had snowed in September that Winnipeggers had become complacent about its possibility. The last time it snowed in September was in 2003, but the last time snow actually accumulated in September was in 1984. On September 22, Mother Nature proved that it can still snow in September. A band of snow pushed through the Red River Valley in the evening which came down heavy at times. Winnipeg was right on the edge of the band with only a trace at the Airport, but 0.4 cm in Charleswood and as much as 1.0 cm along the South Perimeter. The city dodged a bullet however, with 5 to 10 cm recorded west and east of the city. Not only was this the first measurable snowfall in Winnipeg since 1984, but it was also the 3rd earliest date on record to see measurable snowfall since 1872. The earliest occurrence was on September 19, 1945. It was the earliest since 1947 when 0.8 cm fell on September 21. It was also the first time since 1872 that snow had been recorded on September 22. As if one snowfall wasn't enough, it then went on to snow on three other days the remainder of September, giving a total of four snow days in September 2018. Only two of these days actually saw accumulation however (0.4 cm on September 22 and 0.2 cm on September 28). With 0.6 cm of snow in September at the official site in Charleswood, it was the 13th snowiest September on record since 1872 in Winnipeg. A trace snow depth was also recorded during the 12 UTC observation on September 28, only the second time since 1955 that snow was recorded on the ground in September during the 12 UTC observation time. The snow was not the only story as it was unusually cold as well. Seven days in September had a daytime high in the single digits, tied 2nd most in September since 1872 (most was 8 days in 1873). Amazingly, only one temperature record was actually broken: a 6.0°C low maximum record on September 23. The coldest daily high was 3.7°C on September 28, the coldest high in September since September 28, 1981 (2.9°C). The cold and snowy weather continued through to mid October, with temperatures mainly in the single digits. In fact, a 2nd coldest first half of October on record occurred in Winnipeg, and both Regina and Brandon had a coldest first half of October on record according to Weatherlogics. A low maximum record was broken on October 14 with a high of only 1.4°C. 4.4 cm of new snowfall also fell on October 3, breaking the old record for the date of 0.2 cm in 1991. With 3 cm still on the ground the following morning, it was the first time snow was recorded on the ground during the 12 UTC observation on October 4 since 1955. The cold weather conditions then continued into the remainder of fall with a November which was 3.3°C below normal and the coldest since 2014. October as a whole tied 19th coldest since 1872 with a mean temperature of 2.8°C, 2.3°C below normal. It was also the coldest October since 2002. All-in-all, it was the 13th coldest fall (Sep to Nov) on record in Winnipeg with a mean temperature of 1.9°C, 2.6°C below the 1981-2010 normal. It was the coldest fall since 1991 (mean 1.8°C). Thanks to below normal snowfall in November, snowfall through the fall was actually below normal. Other than temperature and snowfall, an all-time minimum dewpoint (since 1953) was also recorded in September. The dewpoint of -11.1°C on September 30 eclipsed the previous all-time record for September of -8.9°C on September 25, 1965. Thanks to a relatively warm first half of September, September only finished as 20th coldest since 1872 in Winnipeg. However, the cold was most intense out west. Brandon tied for 5th coldest September while Calgary, Edmonton and Saskatoon all had a top 10 coldest September. The early cold weather put a damper on the golf season with some courses calling it one of the worst years on record. After a second driest year on record in 2017, 2018 continued the dry trend with well-below normal precipitation. With only around 393 mm of precipitation in 2018, it was the 15 driest year since 1873. The two-year period of 2017-2018 was the second driest on record since 1873 with only about 727 mm of precipitation, about 69% of normal. The driest set of years was 1960-1961 with about 717 mm of precipitation. The impact of the dry weather in Winnipeg was mostly due to shifting soil, which resulted in numerous properties seeing cracks in their walls and foundations - a very expensive fix. The dryness was at its worst from January to August overall (with a wetter period in late May). Winter 2017-2018 was exceptionally dry with a notable lack of snowfall. In fact, it was the driest winter on record since 1872 with only 14.7 mm of precipitation at Winnipeg International Airport. Farm fields outside the city were mostly bare or had very limited snowpack throughout January and February. January was the 5th driest on record (3.1 mm) and February the 4th driest (3.6 mm). The first major snowstorm of the winter in the Winnipeg area did not arrive until the first week of March. However, the dryness returned immediately after the early March snowstorm with exceptionally dry weather continuing through to mid May. The January to April period was the driest on record since 1873 with only 28.1 mm of precipitation, beating the old record of 36.9 mm in 1875. April was exceptionally dry with only 1.7 mm of precipitation, the 4th driest on record. It was also the 12th driest month on record. There was, in fact, 32 consecutive days without measurable precipitation (0.2 mm +) from April 13 to May 14. This tied with May 7-Jun 7, 1917 for 6th longest such streak on record since 1872. It was the longest since 1980. The dry spell did not fully break until September, which put an end to a 12-month streak of drier than normal months at the Airport (although, May was less than 1 mm below normal). The dry conditions resulted in dust and fire, especially in the spring before the green up occurred. The worst day was April 29 when strong southerly winds, warm temperatures (in the twenties) and low relative humidity resulted in numerous grass fires and clouds of blowing dust through the Red River Valley. One grass fire destroyed the home of the Reeve of Stuartburn. Grass fires were also ignited around Winnipeg with one particular bad fire in South Transcona along with another in Charleswood. Two homes were also destroyed by grass fires in the Interlake in the RM of Armstrong. The largest fire occurred near Badger in southeastern Manitoba. This particular blaze stretched 8 km wide at one point. Blowing dust also choked skies across the Red River Valley, causing reduced visibility and brown skies. The City of Winnipeg had issued an open-fire ban as a result of the poor conditions. A cold front passed through the Winnipeg area early this morning between 6 and 7 am, ending what was an historic heat wave across the southern Prairies. The heat started last Monday (Aug 6) in the western Prairies and last Tuesday (Aug 7) in the Eastern Prairies. However, the peak of the heat occurred from Thursday through Sunday (Aug 9 to 12), and moved from west to east. The heat wave was the result of an upper-level ridge of high pressure over the western US which expanded northward into Canada for several days, spreading a hot and dry air mass into the region. However, by Sunday, humidity also became part of the equation in the Eastern Prairies as south-southeasterly winds pumped in moisture from the US Midwest. The remainder of this post will go through the peak of the heat day-to-day from Friday through Sunday. Note that hotspots for Alberta and Saskatchewan are only from ECCC stations, while in Manitoba, both ECCC and Mb Ag stations are considered. On Friday (Aug 10), the heat peaked in southern Alberta and southwestern Saskatchewan with highs between 36 and 41°C. Southern Manitoba reached highs between 31 and 36°C. Multiple all-time records were broken for both the month of August and all-time, in southwestern Saskatchewan and Alberta. Calgary (YYC) reached 36.5°C, the hottest temperature ever recorded at the Calgary Airport since records began in 1881, beating the old record of 36.1°C in 1919 and 1933. It was also the hottest temperature in August, beating the old record of 35.6°C in 1914. As a result of the heat, ENMAX Power reported that the city reached an all-time record for electricity demand. The peak of the heat moved into southern Saskatchewan and southwestern Manitoba on Saturday. Widespread highs above 40C occurred from the US border northward to Regina and Moose Jaw. Temperatures rose very quickly in the morning as well, with temperatures of 38C in the Assiniboia and Yellow Grass areas already by 11 am CST. By noon CST, it had already reached 40.4°C in Yellow Grass. Moose Jaw reached a record 42.3°C, the 2nd hottest day ever recorded in the city since 1894. It was also the highest temperature recorded in Canada (ECCC weather station network) since 2007, when Woodrow, SK reached 43.0°C. Regina reached 41.3°C, the 3rd hottest day ever recorded in the city since 1884. It also beat the old all-time record for August of 40.6°C in 1949. Lastly, it was the latest date in the year that Regina hit 40°C, the previous latest being August 6, 1949. It was a very dry Las-Vegas-style heat in Saskatchewan as well. Relative humidity dipped to 9% at Regina Airport (YQR), the lowest on record since 1953. The previous record was 10% in 1959 and 1961. In Alberta, the cold front moved through Friday night into Saturday, with hot temperatures confined to the extreme southeastern corner of the province on Saturday. Winnipeg reached 37.1°C, the hottest day since August 23, 2011 (37.2°C). It also broke the old record of 34.9°C in 1978. On Sunday, the peak of the heat moved into southern Manitoba and was also still in the extreme southeastern corner of Saskatchewan. 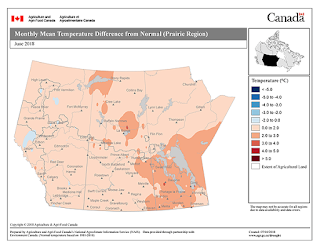 Widespread highs between 35 and 40°C occurred throughout southern Manitoba. As mentioned previously, humidity was also high with dewpoints reaching the low to mid 20s. The humidity gradually decreased through the day due to boundary layer mixing, first in southwestern Manitoba south of Brandon then in the Red River Valley by late afternoon. In Deloraine, the temperature had already reached 33°C at 10 am CDT and 35°C at 11 am CDT. Down sloping wind off the Turtle Mountains helped this localized region heat up much more quickly than its surroundings however. By the end of the day, Waskada and Elm Creek were the only locations that hit 40°C with highs of 40.0°C. In Winnipeg, the high of 37.5°C was the hottest since June 17, 1995 (37.8°C). It also broke the daily record of 35.0°C in 1972 and it was the 9th hottest August day on record since 1873. This was only the third time since 1872 that the city exceeded 37°C two or more days in a row - the last time being in August 1949, and the only other time being in July 1936. In addition, the last time the Airport exceeded 35°C two days in a row was in June 1995. In Winnipeg, the three-day period from Aug 10 to 12 exceeded 32.0°C, officially making it a heat wave (according to the older version of the ECCC weather glossary). This was the first official heat wave at the Airport since a four-day heat wave in August 2013 (Aug 25-28). Note that this definition of a heat wave is not widely agreed on in Canada. The most recent version of the ECCC weather glossary does not even define a heat wave. According to Rob's Obs, it was also the 3rd hottest weekend on record in Winnipeg since 1872. If you would like more information or statistics (such as emphasis on other cities), please contact Weatherlogics or post a comment under this post. This post and the information contained in it is subject to copyright. Copies or dissemination, in whole or in part, is not permitted without permission from the author. All advertisements are automatically deleted by blogger, so don't even bother trying ;). Picture Window theme. Theme images by Airyelf. Powered by Blogger.